Even if there comes a day when the world completely stops emitting greenhouse gases into the atmosphere, coastal regions and island nations will continue to experience rising sea levels for centuries afterward, according to a new study by researchers at MIT and Simon Fraser University. In a paper published this week in the Proceedings of the National Academy of Sciences, the researchers report that warming from short-lived compounds — greenhouse gases such as methane, chlorofluorocarbons, or hydrofluorocarbons, that linger in the atmosphere for just a year to a few decades — can cause sea levels to rise for hundreds of years after the pollutants have been cleared from the atmosphere. Solomon’s co-authors are lead author Kirsten Zickfeld of Simon Fraser University and Daniel Gilford, a graduate student in MIT’s Department of Earth, Atmospheric and Planetary Sciences. Recent studies by many groups, including Solomon’s own, have shown that even if human-caused emissions of carbon dioxide were to stop entirely, their associated atmospheric warming and sea-level rise would continue for more than 1,000 years. These effects — essentially irreversible on human timescales — are due in part to carbon dioxide’s residence time: The greenhouse gas can stay in the atmosphere for centuries after it’s been emitted from smokestacks and tailpipes. In contrast to carbon dioxide, other greenhouse gases such as methane and chlorofluorocarbons have much shorter lifetimes. However, previous studies have not specified what their long-term effects may be on sea-level rise. To answer this question, Solomon and her colleagues explored a number of climate scenarios using an Earth Systems Model of Intermediate Complexity, or EMIC, a computationally efficient climate model that simulates ocean and atmospheric circulation to project climate changes over decades, centuries, and millenia. With the model, the team calculated both the average global temperature and sea-level rise, in response to anthropogenic emissions of carbon dioxide, methane, chlorofluorocarbons, and hydrofluorocarbons. The researchers’ estimates for carbon dioxide agreed with others’ predictions and showed that, even if the world were to stop emitting carbon dioxide starting in 2050, up to 50 percent of the gas would remain in the atmosphere more than 750 years afterward. Even after carbon dioxide emissions cease, sea-level rise should continue to increase, measuring twice the level of 2050 estimates for 100 years, and four times that value for another 500 years. The reason, Solomon says, is due to “ocean inertia”: As the world warms due to greenhouse gases — carbon dioxide included — waters heat up and expand, causing sea levels to rise. Removing the extra ocean heat caused by even short-lived gases, and consequently lowering sea levels, is an extremely slow process. In one particular climate modeling scenario, the team evaluated sea level’s response to various methane emissions scenarios, in which the world would continue to emit the gas at current rates, until emissions end entirely in three different years: 2050, 2100, and 2150. In all three scenarios, methane gas quickly cleared from the atmosphere, and its associated atmospheric warming decreased at a similar rate. However, methane continued to contribute to sea-level rise for centuries afterward. What’s more, they found that the longer the world waits to reduce methane emissions, the longer seas will stay elevated. 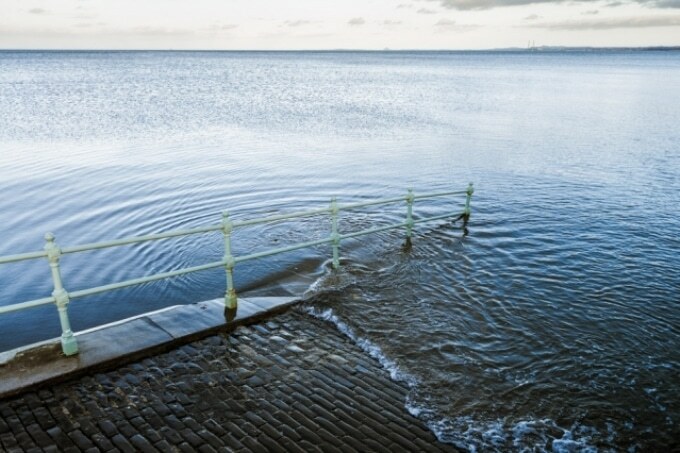 The researchers found one silver lining in their analyses: Curious as to whether past regulations on pollutants have had a significant effect on sea-level rise, the team focused on perhaps the most successful global remediation effort to date — the Montreal Protocol, an international treaty ratified by 197 countries in 1989, that effectively curbed emissions of ozone-depleting compounds worldwide. Encouragingly, the researchers found that the Montreal Protocol, while designed to protect the ozone layer by phasing out pollutants such as chlorofluorocarbons — has also helped stem rising seas. If the Montreal Protocol had not been ratified, and countries had continued to emit chlorofluorocarbons to the atmosphere, the researchers found that by 2050, the world would have experienced up to an additional 6 inches of sea-level rise. This research was supported, in part, by the Natural Sciences and Engineering Research Council of Canada, and NASA.